If you have never tried McDonald’s coffee before, you are missing a tasty cup of joe. McDonald’s McCafe Peppermint Mocha is a seasonal coffee that McDonald’s serves up. The weather starts to cool down and the leaves have changed colors, which can only mean one thing. It’s the beginning of the holiday season. With all the hustle and bustle of the holidays, it’s nice to sit down and relax with a hot drink. The peppermint mocha is perfect for catching up with friends, as an after-dinner treat of just relaxing at home. McDonald’s McCafe has a line of classic holiday drinks that they bring out just for the season – the McDonald’s McCafe Peppermint mocha being one. This hot coffee is bursting with chocolate and minty flavor and joins an ever-growing line of festive holiday beverages. 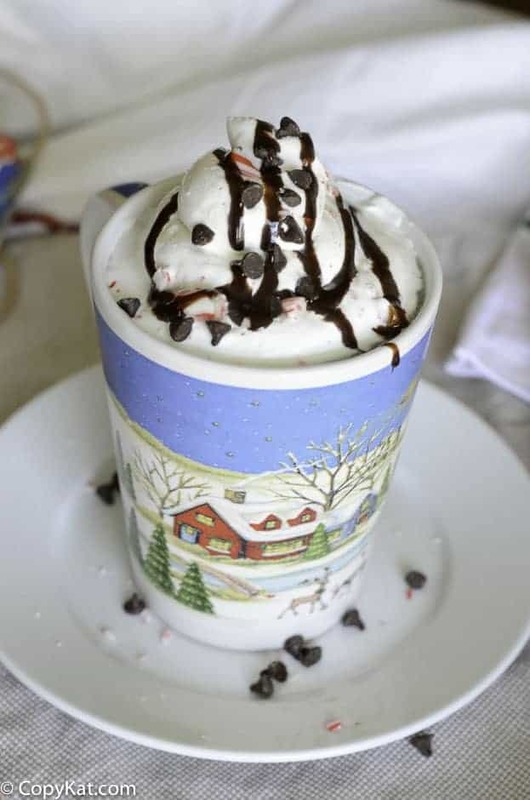 The peppermint mocha is easy to recreate at home. One of the best parts of making it at home is you get to control the entire drink process. Want it extra peppermint-y? Go ahead! Love chocolate? Add extra! It’s fun to take a recipe and make it exactly the way you want it. 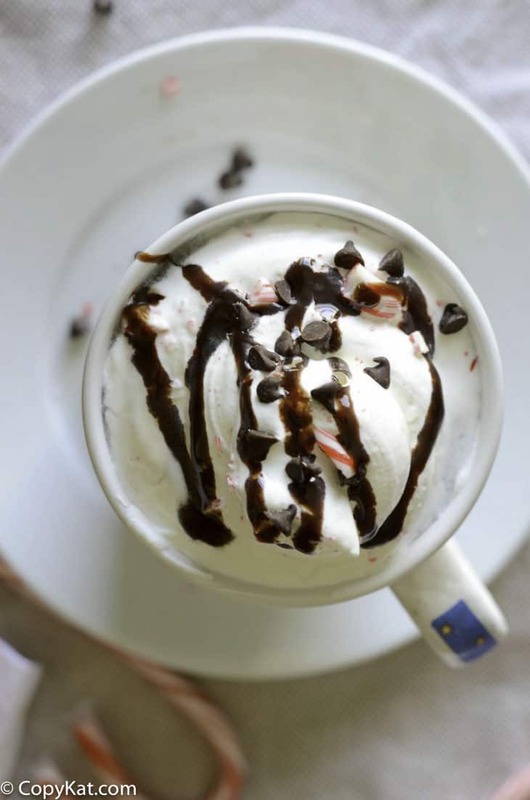 To start making your own McDonald’s McCafe Peppermint Mochas at home, you first need to make homemade peppermint mocha syrup. It’s easy to whip up and once you have it made you are only a few steps away from a peppermint mocha drink. Make sure you use peppermint extract for this recipe, and not peppermint oil. Not all peppermint oil is made for food consumption. This recipe should be made with espresso, but you can use a really strong cup of coffee. A couple of other options are to use instant espresso powder, or you can use one of my favorite tools. A Bialetti Stovetop Espresso Maker, these Espresso makers are under 30 dollars, and they make a decent cup of espresso without using a fancy and expensive espresso machine. I hope you give this recipe a try soon. Making fancy coffee drinks at home is easy to do, and you can save a lot of money by making these drinks at home. Want to try other great copycat coffee drinks? Be sure to try some of these. Recreate this McCafe coffee at home. To make the mocha In a saucepan, mix together the sugar and cocoa powder. Add the water and bring to aboil, stirring constantly. Remove from heat, add the peppermint extract and allow to cool. Store in an airtight container in the fridge.To make the coffee: Pour the syrup in a coffee mug followed by the coffee. Add the steamed milk. Top with whipped cream and chocolate syrup, if desired. Oh my josh, my Gran thought this was the best thing ever. You could do a similar work-up for Starbucks spicy “chili mocha.” I mix the dry ingredients and store them in a small Mason jar (although a syrup like you used here would be great too). I made this and it is better than McD’s.. just my personal thought. OOh, I really have to try this sometime soon. If I can pass by McDonalds this week I’ll be sure to ask for one!